The Occupational Health and Safety Act and the German Ordinance on Hazardous Substances stipulate a compulsory risk assessment to be carried out by the employer for activities related to the handling of hazardous substances. Very often this requires workplace measurements. The IFA Folder (IFA-Arbeitsmappe) and its online version IFA-ARBEITSMAPPEdigital are published by IFA (formerly BGIA) as a guide for companies and measuring laboratories involved in the determination of exposure to chemical and biological hazards. 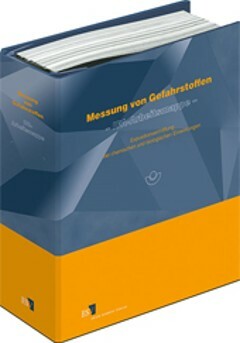 The Folder is published as loose-leaf collection and online version IFA-ARBEITSMAPPEdigital (www.IFA-ARBEITSMAPPEdigital.de) by Erich Schmidt Verlag (in German only). This collection is permanently adapted to the evolving technical regulations and supplemented by descriptions of new or modified measuring methods. The online version makes downloading of single documents (code numbers) possible using a shopping cart. For the access to the IFA-ARBEITSMAPPEdigital a personal identification is needed. Index group 8 (documentation of measurement and workplace data) and the general part are accessible free of charge.